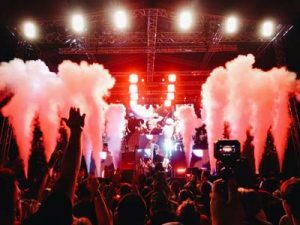 Audiences were blown away by stunning pyrotechnic effects at the Livewire Festival over the recent August Bank Holiday weekend. The Special Effects (another company did a Firework display so we shouldn’t mention Fireworks), provided by Entertainment Effects, accompanied a spectacular set by Jazzy Jeff and The Fresh Prince at the Blackpool event. Jazzy Jeff and The Fresh Prince are best known for their acclaimed 1980 and 1990s hip-hop oeuvre, which included hits like Miami, Summertime and Boom! Shake The Room. Will Smith’s time as rapper ‘The Fresh Prince’ in the duo gave him his first big break, and he went on to star in smash sitcom The Fresh Prince of Bel-Air, before carving out a stellar Hollywood career. But super-fame doesn’t mean he’s outgrown the original partnership; Jazzy Jeff and The Fresh Prince recently reunited to wow the Blackpool crowds performing their new single, Get Lit. The show was an extravaganza of special effects, with pyrotechnics including stage pyro, roof pyro, CO2 jets and flames. Entertainment Effects worked with our partners, staging equipment suppliers Hi-Lights and Eddie Romack at US-based special effects company Strictly FX to produce a stunning and explosive show. Tic, tic, tic, tic (not tick), boom! Entertainment Effects were even on hand in Blackpool to help Jazzy Jeff overcome a personal fear. A little anxious about pyrotechnics, the DJ enlisted some help from our team, who showed him how to press the button to set off a sample shot. You can see the results in Jazzy Jeff’s Facebook video!